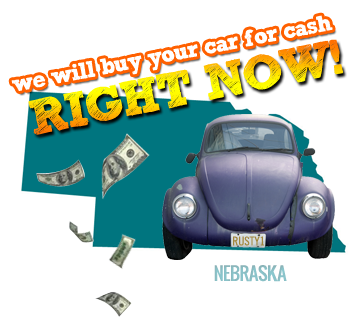 We Buy Junk Cars in Nebraska. Sell Your Junk Car Today For Cash & Get Top Dollar + Free Removal. If you’ve been thinking lately, “I need to junk my car”, then you should most definitely call Rusty’s Auto Salvage. We pay on-the-spot cash for old cars and make sure that you get the best possible price for your scrapped vehicle. Not to mention the car removal is free of charge. All across the U.S. we are known for our consistency and reliability in service as our network of local junk yards and salvage yards extends throughout each of the fifty states. Our service towers cover every town, city, and county in the state of Nebraska. Just call us any time before 5PM NE time and we will come same day to pick up your vehicle. How much money you will receive for your junk car depends on a couple things such as the overall condition the car is in and whether we decide to scrap, junk, or salvage your car. Either way rest assured because you will get the best deal for your car no matter what. The types of cares we buy range from high mileage cars to flood damaged cars to cars that have been damaged or completely wrecked in an accident. Junk sedan, junk coupe, junk van, junk SUV, it does not matter – we buy them all! Don’t forget that even if the car isn’t running you can still get a great price for it. Just do one thing and make sure you personally and legally own the vehicle you are trying to scrap. If you don’t already have one make sure you obtain the title to your car. We can’t buy your junk car if you don’t legally own it! Don’t wait any longer and get rid of that rotting piece of scrap metal taking up space in the far corner of your backyard or collecting dust in your garage. Call Rusty’s Auto Salvage today for a free quote! It’ll take no longer than 2 to 3 minutes! The staff were courteous. We had a lilttle problem with oil on our driveway from the tow truck but other wise good service. Set up an appointment with your NE tower. You do not have to be present at time of pickup - alternative payment arrangements can be made. Arrangements for junk cars in Nebraska missing keys, registrations and/or titles can usually be accommodated.